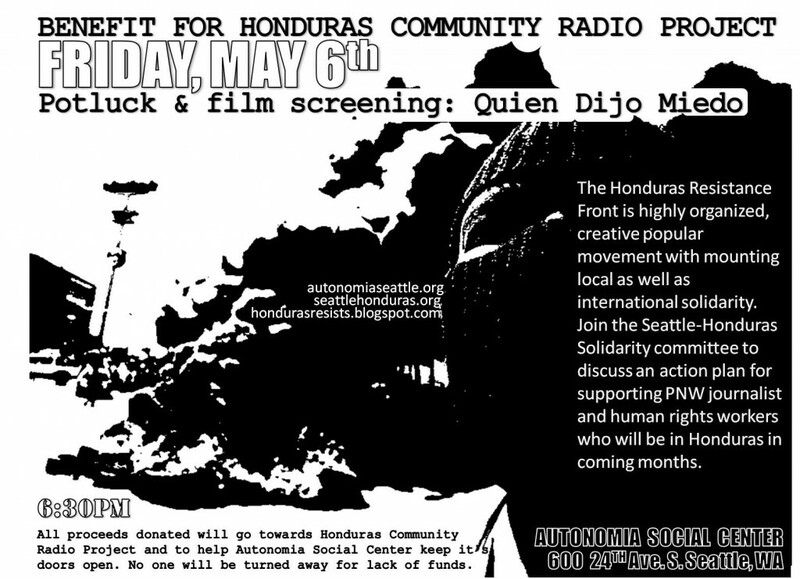 At 6:30pm on Friday, May 6 the Seattle Honduras Solidarity Committee is holding a potluck and screening of the documentary “Quien Dijo Miedo,” about resistance and repression following the 2009 coup. The event is a benefit to support community radio projects in Honduras, and will be hosted at Autonomia, a recently formed radical social space in Seattle, located at 600 24th Ave. S. Don’t miss it, and thanks to all who are organizing these important projects! Aside | This entry was posted in News and Analysis and tagged autonomia, community radio, documentary film, FNRP, Honduras, Honduras coup, human rights, Latin America, Quien Dijo Miedo, social space, solidarity. Bookmark the permalink.